Healthy and flavorful, this zesty cod recipe is also super easy to make. Everything goes into one pan and cooks in under 30 minutes; making it a delicious option for a weeknight meal. Heat a large skillet over medium heat, cook fennel, and garlic in olive oil for about 5 minutes, until they become fragrant. Add fresh tomatoes, kale and water and cook for about 10-12 minutes. Add crushed red pepper, fresh oregano and sliced olives. Season with salt and pepper. Place cod in pan, sprinkle with orange zest and fennel fronds. Cover and cook for about 10 minutes. Remove pan from heat, and drizzle fish with olive oil before serving. You always have the best recipes and everything you make my family would devour, this sounds and looks divine! I have planted a kale garden and am always looking for new ways to use it! Just found it! Thank you!! This reminds me of a divine dish I had long ago in Greece! Saving. Sharing! 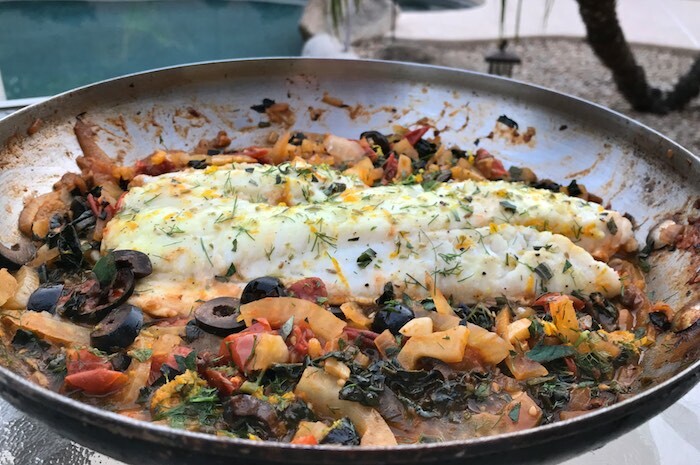 We absolutely love seafood dishes, and the Mediterranean flavors and colorful veggies in this dish take it right up over the top! Love it!